BINGAHMTON, N.Y. — Bryan Reynolds got the Curve off to a grand start Wednesday night, and the club that’s next to last in the Eastern League in home runs had a second straight power surge. Reynolds, who came to the Pirates from the Giants in the Andrew McCutchen trade, belted his first home run of the season, a grand slam in the first inning. Cole Tucker also hit his first homer of the year, and Will Craig belted his eighth in a 7-2 win over Binghamton at NYSEG Stadium. The Curve faced Tim Tebow for the first time, and the Rumble Ponies outfielder went 1-for-4 with a double. 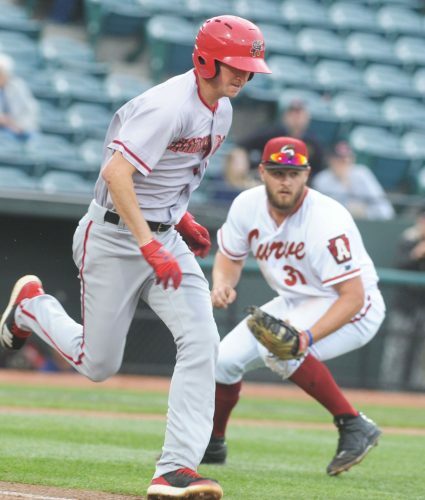 He was 0-for-2 against Curve starter Mitch Keller, then hit a double to right off reliever Yeudy Garcia in the seventh. The Curve entered play Tuesday with just 37 home runs in their first 57 games. But they hit three homers in Tuesday’s 12-3 win, then three more Wednesday. Craig, who had five RBIs on Tuesday, homered for the second straight day. He leads the team with 44 RBIs and is second in homers, to Logan Hill’s nine. Reynolds missed a month and a half after breaking the hamate bone in his left hand and has had a tough time getting going at the plate, hitting .204. But he has hit safely in four straight games and went 2-for-5 Wednesday. Bralin Jackson and Jason Martin singled in the first inning, then Craig walked to bring up Reynolds, who blasted a grand slam off Binghamton starter Scott Copeland. Tucker hit a solo homer in the second, then Craig a solo shot in the fifth. All three home runs came off Copeland (4-1), who came in unbeaten with a 3.18 ERA. All eight Curve starting position players had at least one hit, with Jackson going 3-for-5. Keller got plenty of run support, and that almost always means a victory for the prized pitching prospect. Keller (7-2) had some trouble with his command, walking four, and gave up two runs on four hits over six innings but still earned a comfortable victory. The bullpen followed up with three scoreless innings to finish off the win. The Curve will go for a sweep of the three-game series with a morning game today, then they return home Friday for a weekend series against New Hampshire. Key player: LF Bryan Reynolds went 2-for-5 with a grand slam for the Curve. Key play: Reynolds’ slam gave Altoona a 4-0 lead in the first. Key stat: The Curve hit three home runs for the second game in a row, after being next to last in the league in home runs entering the series. Top 1st: Jackson singled, Martin singled, Craig walked, all scored on Reynolds grand slam (4-0). Top 2nd: Tucker solo homer (5-0). Bottom 2nd: Taylor walked, scored on Keller wild pitch (5-1). Top 3rd: McNeil walked, scored on Alonso double (5-2). Top 5th: Craig solo homer (6-2). Top 8th: Jhang singled, scored on Tucker single (7-2).